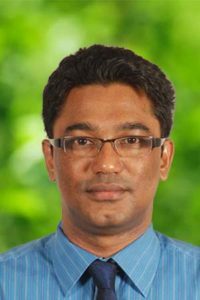 Dr. Sangam Shrestha is an Associate Professor and Chair of Water Engineering and Management Program at the Asian Institute of Technology (AIT), Thailand. He is also a Visiting Faculty of the University of Yamanashi, Japan, National University of Laos, and Research Fellow of the Institute for Global Environmental Strategies (IGES), Japan. His research interests are within the field of hydrology and water resources including, climate change impact assessment and adaptation in the water, integrated water resources management and groundwater assessment and management. Research and development areas include, but not limited to climate change and adaptation in water, integrated water resources management and groundwater development and management. Enhancing the Groundwater Management Capacity in Asian Cities through the Development and Application of Groundwater Sustainability Index in the Context of Global Change. Policy Brief Writeshop for Researchers: An Approach to Promote Greater Science-Policy Interfacing in South Asia. Understanding and Quantifying the Water-Energy-Carbon Nexus for Low Carbon Development in Asian Cities. SEA-EU-NET 2 – EU-ASEAN S&T cooperation to jointly tackle societal challenges. Comparative research of groundwater management in the coastal areas in Southeast Asia. Assessment of water availability and demand in Thailand in consideration of climate change. Water interventions for improving smallholder farming and rural livelihoods in Asia and the Pacific. Curriculum Development for an Undergraduate Program in Water Resources and Environmental Engineering in Kandahar University, Afghanistan. Awarded The Takeda Techno-Entrepreneurship Award (2007) by The Takeda Foundation, Japan for techno-entrepreneurial achievement for world environmental well-being. Awarded AIT –DANIDA full scholarship (2002-2004) to pursue Masters of Science in Integrated Water Resources Management in Asian Institute of Technology, Thailand. Awarded Tribhuvan University Merit Scholarship (1997-2000) to pursue Bachelor of Science in Agriculture in Institute of Agriculture and Animal Science, Nepal. Invited key-note speaker on ‘Groundwater and climate change: No longer the hidden resource’ in the National Symposium on Challenges and Opportunities for Sustainable Management of Groundwater Resources of Kathmandu Valley, Nepal’ on 28 December, 2009 in Kathmandu, Nepal. Invited speaker on ‘Groundwater management in Asia- experiences on Asia cities’ in the Groundwater Expert Meeting: Sustainable Groundwater Resources Management of Kathmandu Valley, Nepal, organized by the Kathmandu Valley Water Supply Management Board (KVWSMB) on 4-5 July, 2010 in Hotel Himalaya, Nepal. Invited speaker on ‘Climate change impact and adaptation in water sector’ in International Symposium on the ‘Sustainable Water Management for Green Growth’ organized by Korea University Sejong Campus on 29-30 October, 2010 in Seoul Korea.